Today was the Karl Kamper Memorial Lecture here in the ol' DAA, and one of the first astronomy talks in a while that has actually gotten me excited about astronomy. Prof. John D. Monnier of the University of Michigan gave a talk entitled "Imaging the Surfaces of Stars", where he described his involvement in using the Michigan Infrared Combiner (MIRC) of the CHARA Array on Mt. Wilson, CA to actually get an image of the surface of stars. 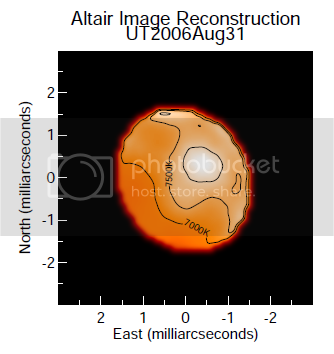 Now, you may notice that Altair is not uniform in colour (and thus in temperature). This is because the rotation of the star causes it to be more flattened along its axis of rotation, and bulges around the equator. This means that the surface at the equator of the star is further from its core, and is therefore cooler at the equator than at the poles. (This is really an over-simplification, but the idea is essentially right.) Monnier's group has found that for very rapidly rotating stars, the temperature gradient between the equator and the poles can be several thousands of degrees, and that's where the trouble begins. Prof. Monnier also talked about his work in imaging the star Epsilon Aurigae. This is a very special object because every 27 years, it is eclipsed by something. It was postulated that there was some sort of compact object in a binary orbit with the star that has a large dusty disk, and whenever this disk would pass in front of the star, the star's light would be blocked. Sean Carroll wrote a really long blog entry about it a few months ago, so I won't go into too much detail. The really cool thing is that in 2009, Monnier's group was actually able to image this dusty disk passing in front of Epsilon Aurigae. There were also a few other things that I can't remember off the top of my head right now, and obviously I didn't take notes because I was busy knitting. Observational astronomy and stellar astrophysics aren't really my thing, but when cool stuff like this is going on, it's hard not to get excited!